A couple of months ago I received a message from a reporter from Dr. Sanjay Gupta’s office. There was a planned expansion on bipolar disorder for his website “Health Matters with Dr. Sanjay Gupta,” and I was asked to be interviewed. 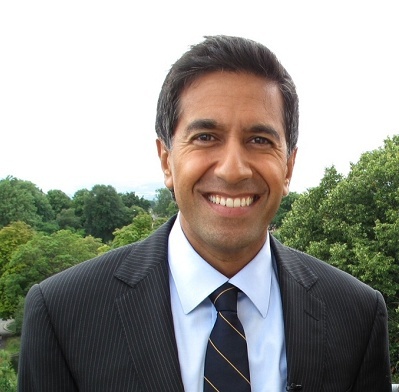 In case you don’t know of him, Dr. Sanjay Gupta is the multiple Emmy®-award winning chief medical correspondent for CNN, a practicing neurosurgeon and associate chief of neurosurgery at Grady Memorial Hospital and an assistant professor at Emory University Hospital in Atlanta. He is a columnist for Time magazine, and a contributor and to CBS News. Wow–I love Gupta–this is very cool! I thought it was very cool also. Congratulations, Bradley! Your interviews are great. Very informative. I can relate for I, too, have bipolar type II with rapid cycling. I was diagnosed as depressed for over 20 years until I was diagnosed bipolar type II. My depresssion was completely debilitating, but now I can see how my hypomania and getting overstimulated leads to exhaustion and depressive rebounds. Kitt, the more I get to know you the more it scares me. I think we are twins separated at birth. I know, right! I’m 51, too! Wow! I’m very happy to see that Dr Gupta’s site did such a great job. I checked out much of his website and feel he got it right. So far, other than your interview, I haven’t found anything written about rapid cyclers. Maybe I need to finish exploring the website. And you, Bradley, did awesome in your interview. Thank you for being so open and willing to become vulnerable for the benefit of others. Congratulations. I’m equally impressed at how the website turned out. Good point about the rapid cycling. It should be there. I think I’ll send it as a suggestion. You should too.